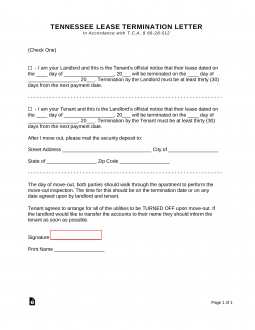 The Tennessee Lease Termination Letter is a legal document that may be used by either the landlord or tenant for the purpose of serving 30 days notice to vacate a premises one to the other. The document will provide the notice necessary to remain in compliance with termination of a long term or month to month lease agreement. Step 2 – Both parties must arrange a final walk through of the premises. Step 3 – The tenant must make arrangements to have the utilities either moved or turned off. If the landlord would like the utilities to be returned to their name, they must make these arrangements.